The Fish River offers a number of interesting possibilities. The 17 mile run from the Eagle Lake public landing to the Blockhouse in Fort Kent can be done easily in one day. Or if you prefer, you can make a 2 day trip of it and camp out just below Fish River Falls. Eagle Lake public landing to the foot of the lake (approx. 5 miles). The Lake is heavily built up with cottages and camps. This section is primarily wild. Soldier pond is surrounded by houses and also has a store with snacks, pizza and sandwiches. If you are looking for a shorter trip you could put in here. Soldier Pond to Fish River Falls (approx. 5 miles). This section is mostly wild with only the occasional cottage. The carry trail around the falls is a bit of a strain; a more efficient method would be to line your canoe through. There is a good swimming hole below the falls with a 15 foot rock ledge just right for perfecting your cannonball. 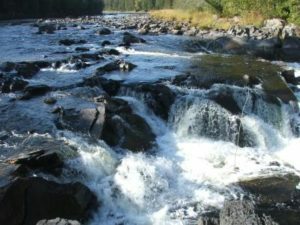 There are a number of potholes at the falls scoured out by the annual spring runoff which are large enough for a person to hide in. Fish River Falls is about 5 miles from the hotel by car. The walk to the falls takes 8 to 10 minutes on an improved trail. Many locals bring a big inner tube and float down to town. This can take anywhere from 1 to 3 hours depending on how much horsing around and splashing you do. flows into the Saint John River. A great day in the outdoors and you are only a half mile from the hotel and a hot shower. 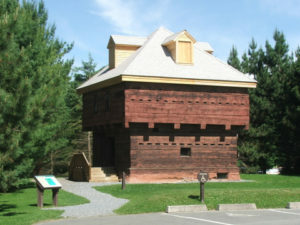 Blockhouse tours are conducted by the Boy Scouts during the summer school vacation.